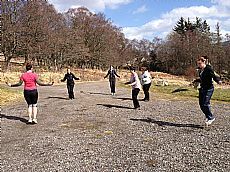 Scottish Boot Camp is located in the beautiful wilderness setting of the Highlands of Scotland. The nearest city to camp is Inverness, which is where we first meet you at the Thistle Hotel between 2:30 - 3:30pm, before we transport everyone to our boot camp accommodation in the minibus. Registration begins at the Thistle Hotel on Saturday afternoon, and the camp ends the following Saturday morning, when you will be transported back to the hotel for your return journey home, between 10:00 - 11:00am. Those wishing to travel by car can follow us up to the boot camp accommodation after the meeting. Inverness is extremely accessible and well served by transport links from the rest of the United Kingdom, so getting to the Thistle Hotel is very straight forward. However if you do have any problems you can call our mobile number on the day, which is sent out prior to your arrival. Inverness Airport is 8 miles away. From the airport you can take a taxi to the hotel or an airport shuttle bus which runs regularly to the city centre and passes the Thistle Hotel on route.